A food mill showed high vibrations during operation. In order to reduce the food mill vibrations, an FEA model of the food mill was developed, which is suitable for dynamic simulations. 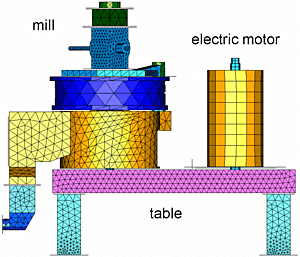 The model includes the electric motor, the mill rotor, the mill housing and the table as well as further attachments (top figure). In order to determine the coupling parameters, which are hard to obtain from analyses, an experimental modal analysis was performed. From the correlation between simulated and measured modal data, an applicable vibration model of the food mill was derived. Due to the large polar moment of inertia of the mill rotor, the gyroscopic influence of the rotor speed on the natural frequencies and on the mode shapes of the mill is significant. 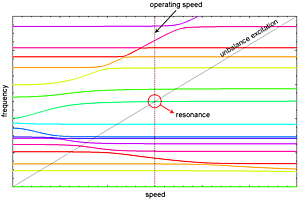 For the original design, the gyroscopics moves the natural frequencies such that a resonance shows up directly at the operating speed (see center figure). The operating vibrations of the food mill were measured during run-ups, run-downs and at operating speed for different loads. Independent of the load the vibrations are mainly excited by unbalances of the mill rotor. The rotor dynamic effects were verified. From the correlated simulation model an optimized food mill with respect to minimum operating vibrations was derived. 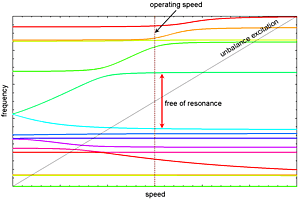 The optimized design guarantees resonance-free operation in the range of the operating speed (bottom figure). Additionally, the passing resonances during run-ups and run-downs are significantly reduced. The effectiveness of the optimized design was proven by operating vibration measurements.